Author: Wilhelm J.G. Möhlig. Series edited by: Bernd Heine, Wilhelm J.G. Möhlig. 26 pp. Roman, 373 pp. 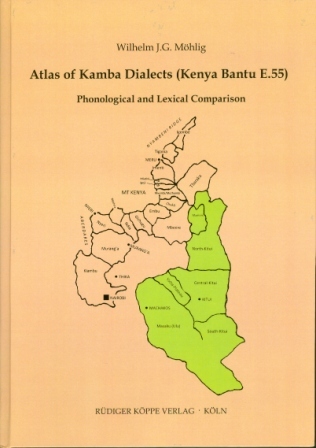 The empirical basis of the Kamba Dialect Atlas is a compilation of about 36,000 lexical items collected in over 60 locations within the Kamba speaking area of Kenya between 1970 and 1990. The items were raised with the help of questionnaires containing between 600 and 640 keywords drafted in English and in Swahili. The Kamba documentation belongs to a comprehensive research project that includes all languages of Central Kenya Bantu on the slopes and in the neighbourhood of Mount Kenya from Igembe in the Northeast up to Gikuyu and Kamba in the Southwest. Whereas the first part of the data was already published in 1974, a larger portion of publishable data concerning particularly the Kamba dialects had to be left behind because of mass problems. In the meantime, powerful computers equipped with adequate programs enable us to analyse and compare any amount of dialectological data at the same time. Dialectological analyses make visible the communicational network of Central Kenya Bantu and the dominant position of Kamba within that network. Its growth and its permanent re-structuring over the past centuries were caused by cultural exchange and far distance trade between the East African coast and the people of the hinterland. 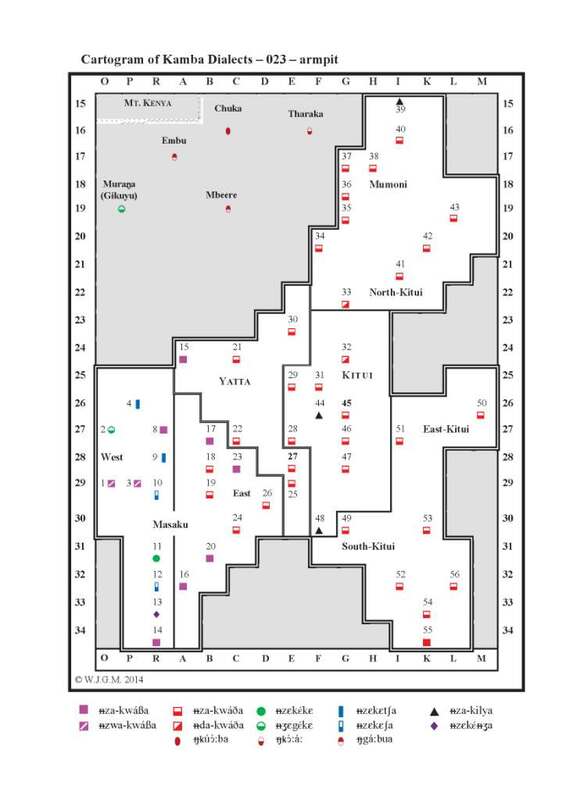 Some Kamba dialects had a dominant position within the communicational network. In the period of the pre-colonial trade in the 17th and 18th centuries, the eastern Kamba dialects of Mumoni and Kitui acted as important intermediaries. At the beginning of the colonial period, the western Kamba dialect of Masaku gained a supra-regional importance. It has kept this position up to the present. Like a history book, the Atlas shows the various mechanisms of contact and internal cultural development that have influenced and shaped the modern dialectal landscape of Kamba and its adjacent Bantu neighbours in a temporal perspective comprising several centuries. Thus, it is not only a tool of comparative Bantu studies, but also of contact linguistics in general. Aboutissement partiel d’un projet descriptif et comparatif plus vaste commencé dans les années 1960 et qui visait à inclure toutes les langues bantoues du Kenya central, l’atlas dialectal du kamba publié par W. Möhlig en 2014 fait partie de ces ouvrages de géographie linguistique que l’on souhaiterait voir paraître plus souvent. Son auteur, expert des langues de la region et grand connaisseur du terrain, nous offre un ouvrage de référence de 399 pages d’une grande qualité tant en ce qui concerne les analyses développées que sur les plans théorique et méthodologique. Les études proposées témoignent d’une grande rigueur et d’une très bonne vue d’ensemble.